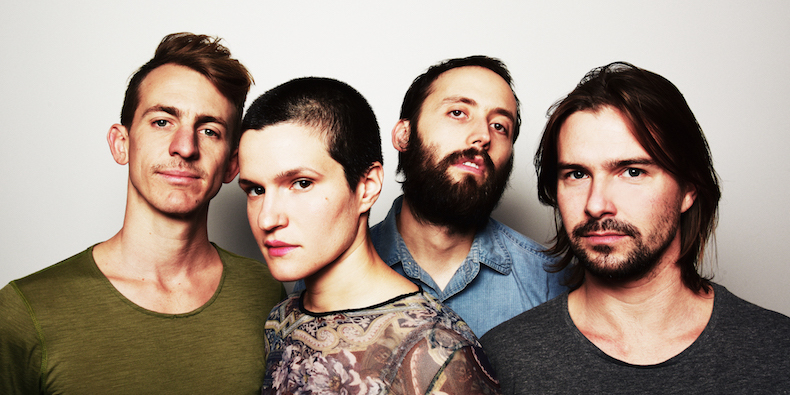 Brooklyn band Big Thief have been making huge waves after releasing their aptly titled debut album, “Masterpiece,” last year to mass critical acclaim. After a year of touring, including a show at SXSW and performing on Late Night with Seth Meyers, their sophomore album is coming out this summer. The first single off the album, “Mythological Beauty,” is a reflective semi-autobiography about singer Adrianne Lenker’s mother and her struggles, as well as the sympathy Lenker feels as a daughter. The song comes in three parts. First, Lenker imagines her mother as a young child and seeing the world through her eyes, moving on to think about how young her mother was when she first had her. Then, Lenker remembers a time her mother told her about the half-brother she has never met. Lastly, she thinks on an incident that happened when she fell out of a tree at the age of five and hurt her head. The song is composed of Lenker’s acoustic guitar, accompanied by the guitarist Buck Meek’s subtle touches of electric, with a sharp and steady drumbeat and the faintest bass line. It is not a complex song, but it fills the listener with emotion and takes them on a journey, like one is viewing Lenker’s life through a camera roll. This is highlighted by the fact that the cover art is a photo of Lenker’s mother holding her as a baby. Thematically, the song is about the difficulties of motherhood, especially at a young age. Lenker sings about the sympathy we all feel for our mothers, to whom we owe everything. Lenker also relates her similar fears and the new sensation of coming to the age at which her mother first began her family. However, her qualms are resolved with the comforting chorus, “You’re all caught up inside, but you know the way,” a line that speaks to both Lenker and her mother. Like the bright and unwavering arpeggio of the guitar, this is something to be leaned upon for support, something to always return to. Big Thief has the habit of naming their songs all too appropriately, from the singular “Masterpiece” to the exquisite “Real Love,” and “Mythological Beauty” is no different. The song is beautiful in its ability to transport the listener to another time and place for just a few minutes. The fantastical music video, featuring a cameo from Lenker’s mother, only serves to emphasize the transportive quality of the song. It’s something to listen to when you just need to escape. Big Thief’s new album, Capacity, will be released June 9th, and is available for pre-order right now at saddle-creek.com.